Trafitek's ANPR System is of great help to law and order authorities. It automatically captures images of moving and parked vehicles, converts them into alphanumeric characters, compares the obtained plate numbers with one or more databases of vehicles of interest to law enforcement and other agencies, and proceeds to alert officers when a vehicle of interest has been observed. It does all this within seconds enabling swift action when a vehicle of interest is spotted. The system uses Optical Character Recognition (OCR) software that accurately converts the captured images in to alphanumeric characters. A properly set up ANPR-System recognizes more than 90% of vehicles. Capable of recording high speed vehicles on motorways without significant loss, the system is capable of recording heavy traffic volumes with observed 2,300 vehicles per hour. Trafitek has come up with both off-line and on-line versions of the system. Offline Mode: The camera feed needs to be manually connected to a server with the ANPR software running on it to process the images. Online Mode: The images from the road-side camera are streamed through Ethernet cables connected to a central server for further processing. The full string is identified by the Optical Character Recognition (OCR) algorithm and is checked for international plate syntax to determine the country of origin. 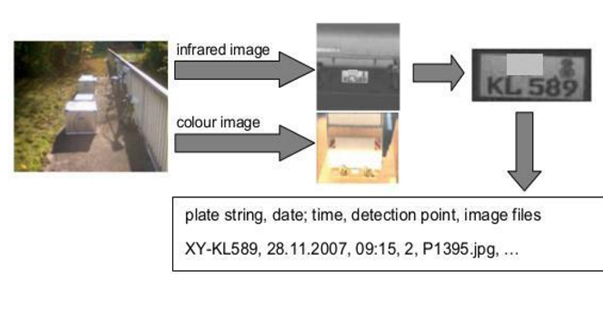 The number plate string is saved in conjunction with a time stamp and the ambiance image of the color-camera to a database. The string thus identified is then compared with the database of vehicle numbers and the matched result is presented to the user. A system which starts small and simple, can in time grow large, both in terms of functions and area coverage.